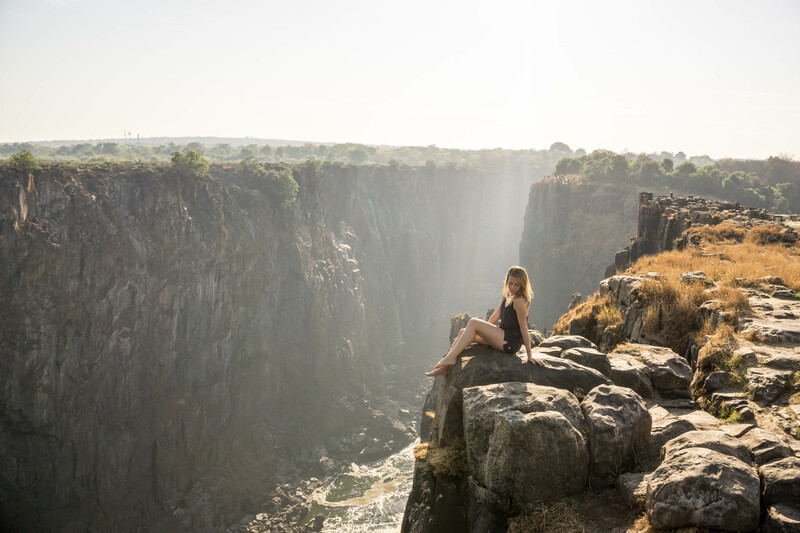 Our next stop was to see Victoria Falls from the 2 countries that share it, Zimbabwe and Zambia, with a quick detour to Hwange National Park in-between. It was a great way to spend my birthday week admiring the scenery, wildlife and partaking in a few adrenaline-pumping activities! Here are the highlights and some info on where to stay, what to do, and where to eat. Victoria Falls the town is quite small, and overrun with tourists. As a result, it’s pretty expensive – particularly compared to Zambia just across the bridge. And, of course, the tours are all very expensive. But it’s well worth the trip, as you get an amazing view of the falls. 75% can be viewed from the Zimbabwe side, with only 25% viewed from Zambia. We got a private room at the N1 Hotel, which was relatively inexpensive and about as central as you can get. It has air-conditioning, which is a blessing when visiting in October (also known as ‘Suicide Month’ because of the deadly heat), and a pool. It also has a little convenience store that sells cheap beer, water and snacks. 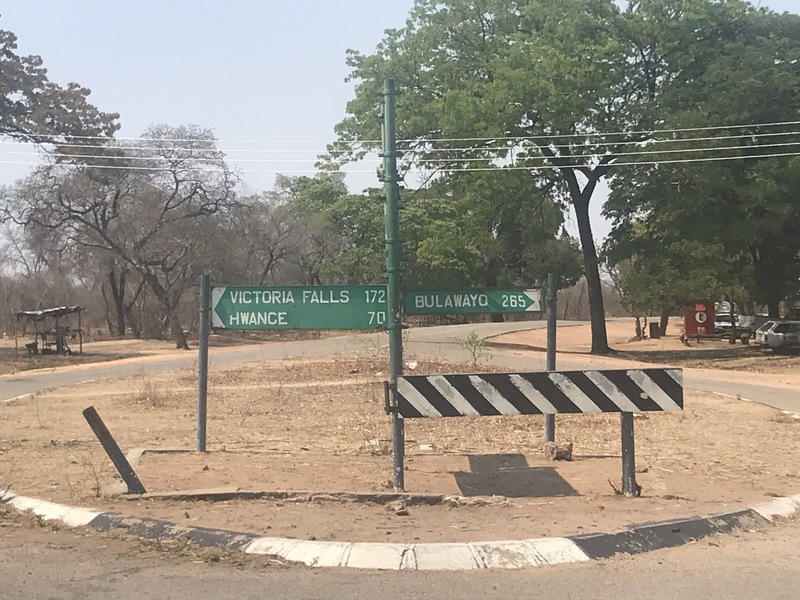 It’s roughly a 30 minute walk to the bridge and you can cross the whole thing without a Zambia Visa; you just get a bridge pass from the border when you are going through. [Side note: since we were visiting both Zim and Zam, we opted for the $50 USD UniVisa, which allows multiple entries into both countries]. 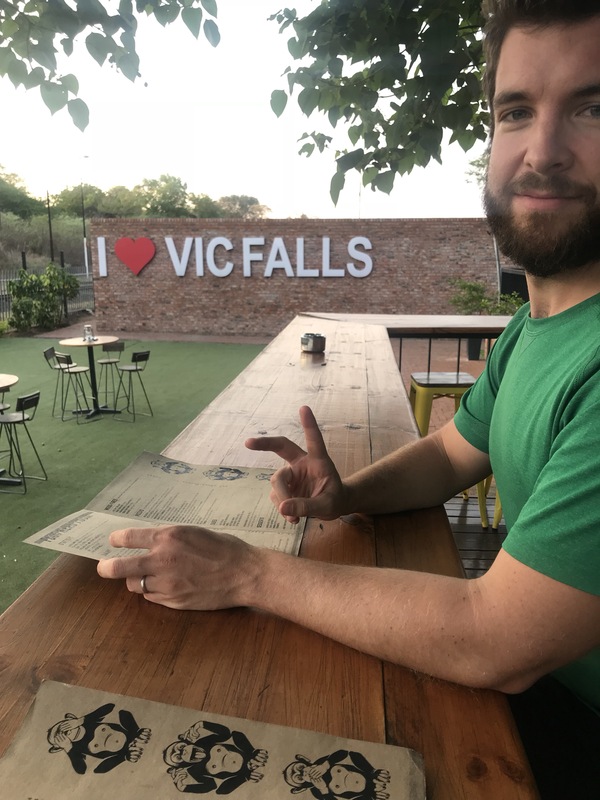 We only had three meals out while in Victoria Falls, and 2 of the 3 were at The Three Monkeys which was conveniently located close to our hotel and had excellent food. We shared a pizza for lunch one day, and a chicken burger for dinner the next. The portions are HUGE and they were happy to split our chicken burger onto two plates. Meals were $20-25 USD including drinks and tip. The other spot we tried was the Shearwater Bridge Cafe, where you can register for bungee jumping. We had breakfast there after James’ jump and the bacon & egg roll was delicious. The rest of the menu looked great too and we would have happily had lunch or dinner there if it was closer to our hotel. Naturally this was what we were there for! To be honest, there’s not much else to do in this small town – though there are quite a few daytrips that can be organised if you’re looking for something. The park opens at 6 am and we arrived shortly after so James could fly his drone unnoticed and before the helicopter flights began around 8 am. Regardless, I would recommend going first thing – we only ran into 2 other small groups while walking around, and by the time we were exiting closer to 8 am you could see large tours coming into the park. Plus, we were able to beat the heat! I don’t think the short hike would have been nearly as enjoyable in 38 degrees. James also bungee jumped off the bridge, though I could not be convinced! After finishing up at the falls, we walked over to Shearwater Cafe and hung around on the picnic tables until they opened at 9 am. James was the first jumper of the day, which I think added to his nerves, but he attracted quite a crowd of tourists eager to see him take the plunge! Since we were not in a rush, we decided to spend two nights at Gwango Heritage Resort, which borders Hwange National Park. 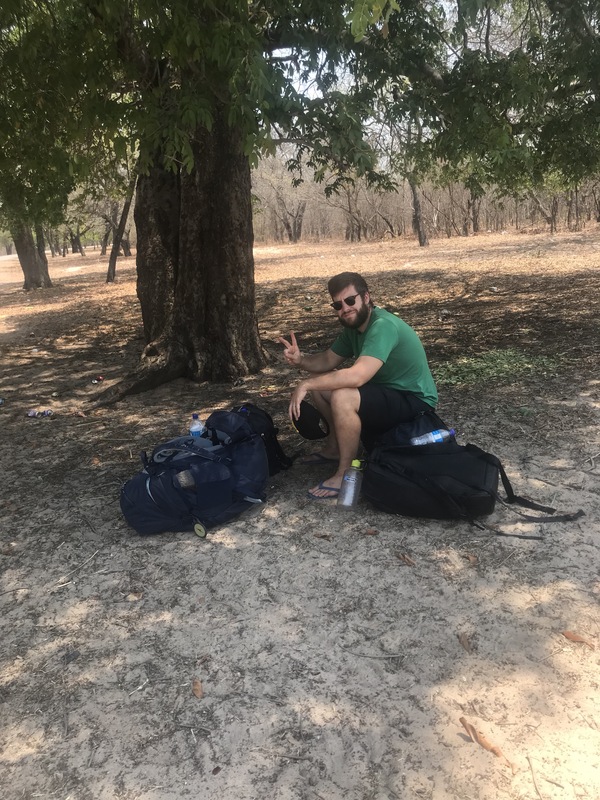 Instead of booking a private transfer, we took a bus from Victoria Falls to the crossroads (literally just a stop along the highway) where you turn off to get to the park. We had no problem getting a ride from there and the total transportation cost was $31 USD for both of us. The resort itself is great. There are small villas with en-suites, which we stayed in. The staff is incredible and the food was some of the best we’ve had. The crocodile skewers were delicious and light and the signature salad was refreshing after eating way too much fried food. The only complaint from us was the unbearable and unwavering heat (but I guess that’s what we get for visiting during suicide month) which brought with it an onslaught of flies that would fly in and around your nose, ears, mouth and eyes. Quite annoying! Game drives tend to be in the morning, late afternoon and evening so it’s best to try and escape the sun and the heat in one of the lounges near reception during the middle of the day (the rooms are not air-conditioned and can get quite stuffy in the heat). Though the lounges are open walls, the shade helps with the heat and flies and the WiFi connection is best here. On our first night, we went on a nighttime game drive for $35 USD pp. Since the national park borders the resort’s land, many animals can be seen just outside the main area which is where Roger, our guide, took us. We saw a variety of nocturnal animals – including several bush babies which was a first for us. But the definite highlight was seeing a leopard stalking around just off the dirt path. Roger was ecstatic, and told us that in his 4 years in and around the national park he has only seen a leopard once! The second day, and our last day there, we went on a late afternoon game drive so we could see the sun set in the park. Little did we know, a group of 12 people arrived around lunch that day and so we didn’t have the private safari we were hoping for – but it was still great and we got the opportunity to meet a few people. The 3 hour game drive is $65, plus you have to pay $20 for the park entry (which we only found out when we arrived at the park as the Gwango staff forgot to tell us). We saw giraffes, lions, kudu, hornbills, and elephants. The real excitement actually began once we left the park and drove around the land near Gwango. Some cheetahs had been spotted, so we headed that way and had the opportunity to watch a mother cheetah and her 4 cubs stalk a kudu. Though the kudu eventually got away, it was quite exciting to see! The next morning before departing, we had breakfast and the staff wrote a special message on my plate for my birthday which was quite sweet! The bus ride back was not quite as smooth, though much more eventful as we waited at the crossroads for 2.5 hours swatting flies away. [There is not really a ‘schedule’ when it comes to buses picking up between towns. All we knew was that the bus we wanted had left the town it was coming from at 8:30 and could arrive basically anytime after 11:30]. Livingstone appears to have a lot more action that Victoria Falls. There was more choice for restaurants, it was quite a bit cheaper and there are a few different activities you can partake in that you can’t from the other side. The only negative to Livingstone (and it’s quite a big one) is that you can’t see most of the falls. And because we visited in the dry season, the portion that you can see was basically non-existent (at least that’s what we had heard, and as a result we didn’t go to the national park to check it out). Livingstone is about 10 km from the falls, and where most of the hotels and resorts are located. After looking on Hotels.com, we decided to stay at Ngoma Zanga Lodge which was wonderful. The rooms are air conditioned, have a fridge and have a walkout to the pool area. The breakfast provided is decent and if you’re after something else, most restaurants and shops (including Shop Rite) are a short walk away. 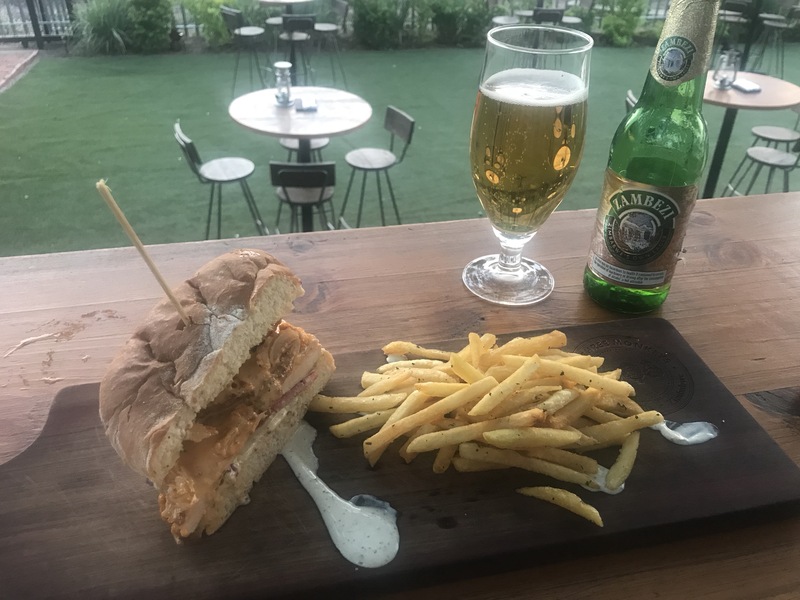 Though, as I mentioned above, Livingstone has more options for restaurants we only had two meals out and they were at the same place! Cafe Zambezi had great reviews and a large menu, so we decided to go there for my birthday dinner. We tried the Kudu Stew which was pretty good and a massive portion. My favourite that night was the cinnamon bananas and vanilla ice cream we had for dessert. 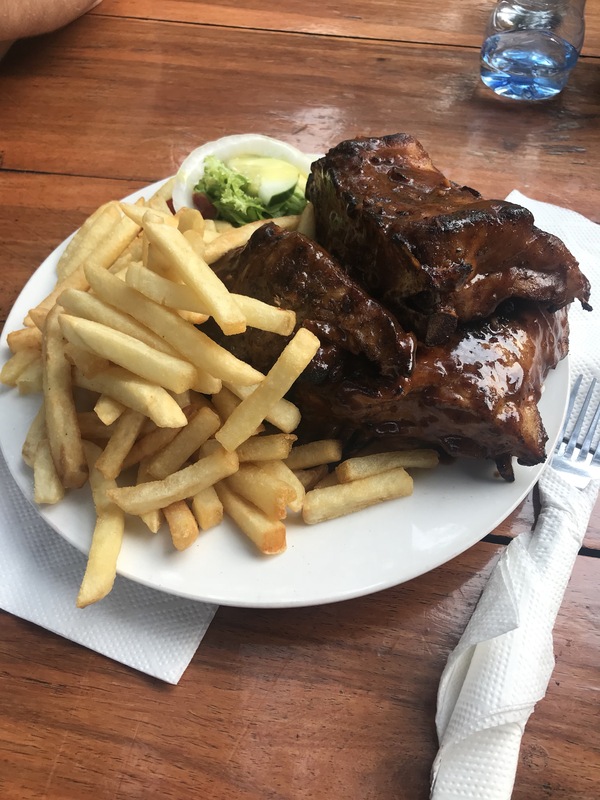 My least favourite was the free shot of tequila they gave me for my birthday 😉 We went back for a late lunch the next day and had the crocodile ribs with fries – again a massive portion that we couldn’t finish. The average cost per meal with drinks and tip was $15 USD. 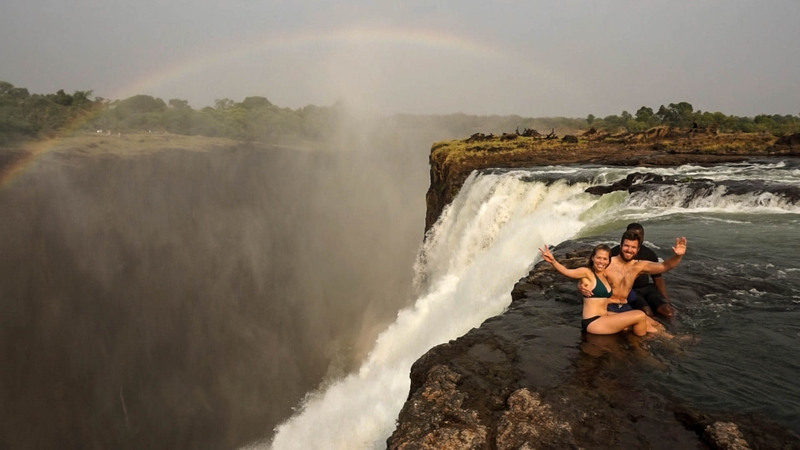 The primary reason we wanted to head to Zambia was to visit Devil’s Pool, basically a small pool on top of Victoria Falls. 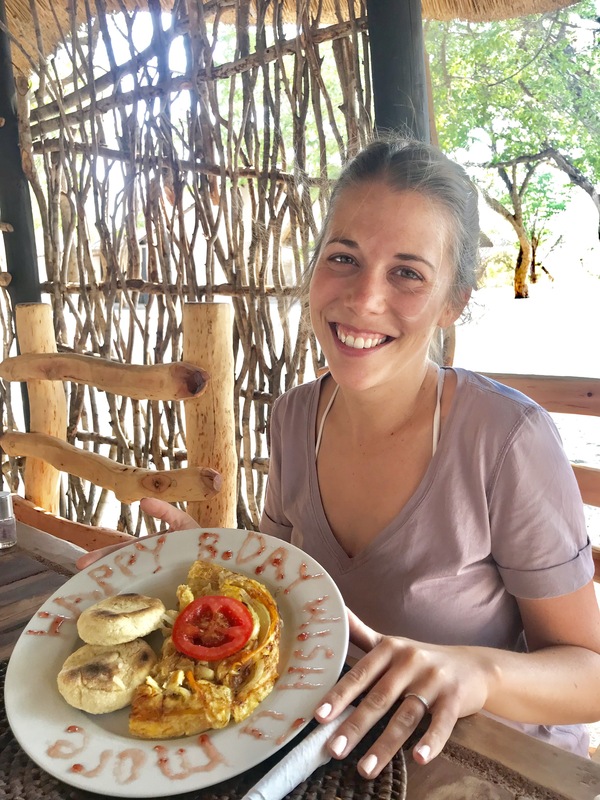 We looked at booking it the day we left Hwange and saw that it was all booked up which was a massive disappointment, particularly since we hadn’t read anywhere that you need to book in advance. James decided to reach out to them anyway and they were able to ‘squeeze us in’. Funnily enough, when chatting with a few other people on our tour they were also ‘squeezed in’ so if you go to book this tour online don’t be discouraged, just send them an email directly. Besides going into Devil’s Pool, the tour was pretty cool! It departs from The Royal Livingstone, which is a gorgeous hotel situated right on the Zambezi. While waiting for our 7:30 am tour we watched Zebra grazing on the immaculate lawns. There were about 16 people in our tour, and we headed off in two separate boats to Livingstone Island where we got some history and our guide stopped to take photos of us in some of the best places along the falls. Then it was time to hop in the water and make our way over to the pool. Since we were visiting during dry season, we walked most of the way and only had one short area where we had to swim. They brought us into the pool one by one, while one guide took cameras and the other sat on the edge. Then we basically took turns going over to the edge with the guide and having a photo shoot. It made for some pretty hilarious if not awkward pics, like the one below. The one thing I hadn’t read anywhere was about the fish in the pool! There are little tiny ones that bite your feet – though I’ve never had one of those ‘fish treatments’ in South East Asia, I imagine it feels similar. Very ticklish! And there are a few larger ones which don’t hurt, but feel just as weird! After our brief stint in the pool, we headed back to Livingstone Island for a breakfast of eggs benedict and pastries. We were back at the Royal Livingstone shortly after 9 and eager to share the pictures and videos with our friends back home! On our last day in Livingstone, we booked a sunset cruise on The African Queen which floats along the Zambezi. It was so picturesque, particularly at the beginning when the waters were calm. We saw elephants playing in the river and hippos rearing their heads up to see what we were doing. 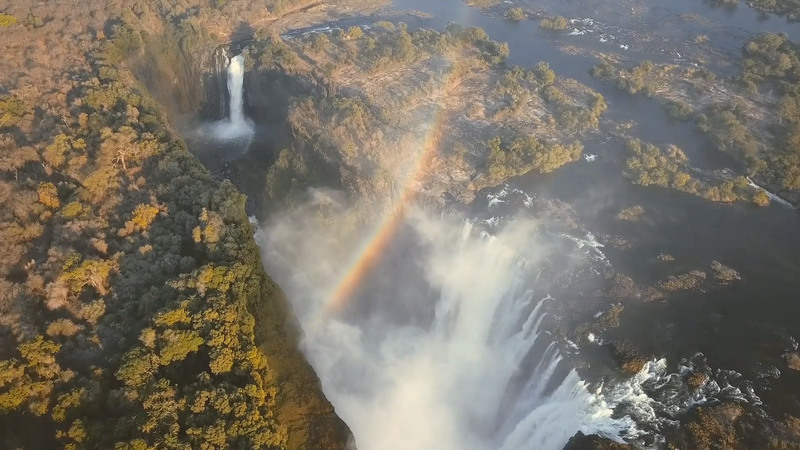 Victoria Falls is stunning, and visiting from Zim and Zam provided different perspectives. It’s well worth seeing the falls from both countries and experiencing not only the unique views, but the differences in the cities and their people. 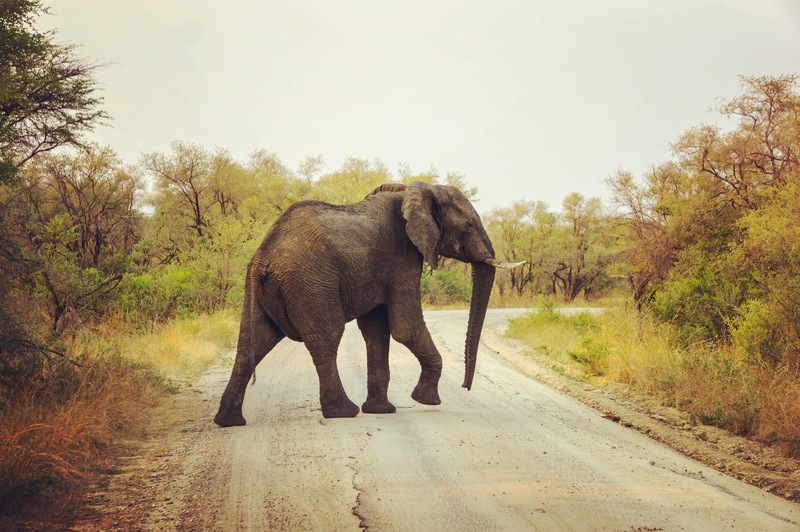 Posted in TravelTagged # explore, #africa, #africablog, #animals, #devilspool, #elephant, #exploremore, #hwangenationalpark, #livingstone, #safari, #travelblog, #victoriafalls, #waterfall, #zambezi, #zambia, #zimbabwe, TravelBookmark the permalink.